Engineering, Agriculture and Medical Common Entrance Test 2015 (EAMCET). HRD Minister Ganta Srinivas Rao said that Andhra Pradesh decided to conduct its own Eamcet 2015 and the notification will be released in the month of March. 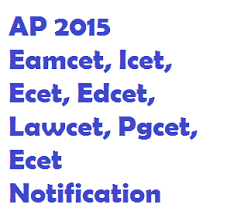 AP State Council of Higher Education - JNTU, Kakinada - Jawaharlal Nehru Technological University, Kakinada will conduct EAMCET 2015 on 8th May, 2015. Apply online for AP EAMCET 2015 once the notification is released in first week of March with details of exam and fee payment. The postings on your site are always excellent. Thanks for the great share and keep up this write my essay reviews great work! All the best to you.